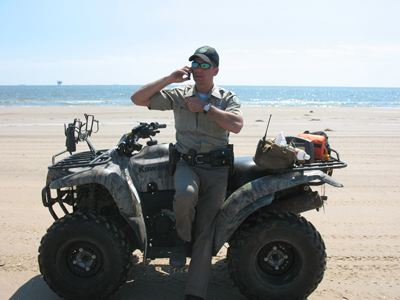 As a Texas Game Warden, Ellis Powell’s main job is to protect the natural resources of the state. But on any given day, he may help back up local law enforcement officers, participate in disaster response, or enforce boating laws on the state’s waterways. It’s all part of his job as a licensed peace officer at the Texas Parks and Wildlife Department. Powell will discuss his job on Wednesday (Sept. 26), during the College of Criminal Justice’s “Real Talk with CJ,” at 2 p.m. in the CJ Center’s CJava Café. Powell works in Newton County, a rural lumbering county that sits at the farthest southern and eastern corner of the state. As the defender of state resources, Powell enforces bag and size limits on fish and game, as well as hunting and fishing seasons and equipment that can be used. Those laws are based on scientific data from biologists, landowners and the general public. For example, earlier this century, the popular Eastern Turkey species was hunted almost to extinction in the state. With the help of the National Wild Turkey Foundation, the TPWD reintroduced the species, and there is now a healthy population that can be hunted. Powell’s job changes with the seasons, depending on the prime activities in the area. In summer and spring months, he is likely to hit the water for water-safety issues and enforcing fishing regulations; during hunting season, he is usually in the back woods. In times of disaster, he may be anywhere. During Hurricane Ike, he was sent to New Orleans for a week to evacuate hospitals. During Hurricane Rita, he was managing traffic in his own area from people fleeing the storm. Without power for 27 days, Powell had to enforce a curfew and to arrange security, food and water for residents of his county. To do his job, Powell has access to multiple modes of transportation, including a truck, two boats and four-wheel vehicles. Powell came to his career as a game warden after spending 11 years in a lucrative job in retail finance. He cashed in his 401K to get his degree at SHSU and did three internships in game warden offices around the state. Powell said the job is very competitive, with 600-700 people applying for just 20 openings. Generally speaking, it’s not a good thing if you are standing in the middle of the psych-cell in the Walker County Jail. If you’re doing it as part of County U, however, it’s a safe, educational, and fun way to learn more about local government. For the fourth year, Sam Houston State University’s Junior Fellows and Walker County have partnered to offer a free, five-week program to the community, which will be held on Tuesday evenings. Beginning Oct. 2, the program will allow participants to get a hands-on, up-close view of county government, from 6-8:30 p.m. Participants will learn directly from elected officials—County Judge Danny Pierce, Sheriff Clint McRae, District Attorney David Weeks, Tax Assessor Collector Diana McRae, and many others. In addition, participants will tour county and community venues such as the Courthouse, the Gibbs-Powell House, the Wynne Home, the Walker County Jail, and more. 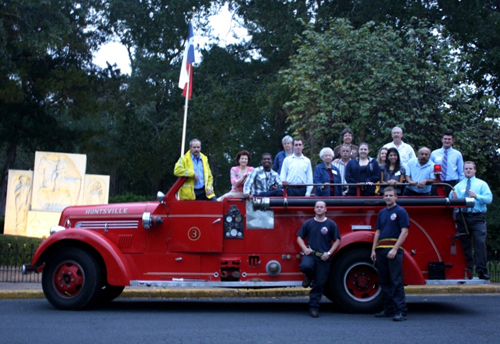 The program has been featured in state and national magazines and is currently the only county-sponsored program in the state, although four Texas municipalities offer similar programs. Activities include budget exercises facilitated by Walker County Commissioners; prosecution exercises overseen by Weeks; and volunteer demonstrations involving the jail’s psychiatric ward and suspect-restraint chair. Tours of the storm shelter, fire station, and up-close demonstrations of the fire-truck and emergency equipment close out the program. The free program is ideal for local residents who want to learn more about their community or those who would like to be more involved in community affairs, according to Junior Fellows adviser Mike Yawn. Registration is requested by Sept. 30. The Junior Fellows organization is a civic group that provides programming to the university and community, participating in more than 100 events per year, donating thousands of dollars to worthy causes, and devoting hundreds of hours to public service. For more information, or to register, contact Yawn at 936.294.1456 or mike.yawn@shsu.edu, or visit the Junior Fellows blog at Politicalsciencejuniorfellows.wordpress.com. The SHSU Student Health Center will administer the influenza vaccine at no charge to students on Tuesday (Oct. 2) and Wednesday (Oct. 3), from 9 a.m. to 4 p.m. in the Lowman Student Center Atrium. In order to receive a flu shot, students must present their student identification cards and are asked to come prepared by wearing sleeves that can be easily adjusted to expose the shoulder in order to speed the administration of the vaccine. There will be an area to disrobe with privacy screens, but an easily accessible injection site will make the process faster and more comfortable, according to health center director Sarah Hanel. The vaccine will not be administered to those who are pregnant or nursing. Students 17 years of age or younger must present a parental consent form prior to receiving the vaccine. Employee vaccinations will be offered the following week, on Oct. 9-10. For more information about the influenza vaccine or the administration process, visit shsu.edu/~uhc_www/ or call 936.294.1805. Sam Houston State University’s Department of Theatre and Musical Theatre will present David Mamet’s powerful two-character drama that explores the destructiveness of miscommunication and excessive political correctness. “Oleanna” will be performed Wednesday (Sept. 26) through Saturday (Sept. 29), at 8 p.m. each day, as well as at 2 p.m. on Saturday, in the University Theatre Center's Showcase Theatre. A dynamic and unsettling drama written amidst the Clarence Thomas-Anita Hill scandal, “Oleanna” centers around two characters: John, a professor, and his female student, Carol. What happens next is subject to interpretation. Did John sexually harass Carol or did his Carol misunderstand him? Written in 1992, “Oleanna” is still as relevant today as it was then, especially when examined as a struggle between those who have power and those who don’t. “I think that in this particular political climate where human rights is one of the hot-button topics, I think it’s really relevant,” said senior theatre major Michelle Ritter, who directs. The play, which has been called "art for the 99 percent," examines academic politics, student/teacher relationships, and ultimately about power in America—who has it, how did they get it and how does having it affect them as individuals, according to one review. Mamet, known for “Glen Garry-Glen Ross” and “American Buffalo,” uses language to reveal his characters. Tickets are $10 and can be purchased through the UTC Box Office, at 936.294.1339. For more information, call the department of theatre and musical theatre at 936.294.1329. While the national unemployment rate has slowly edged down to 8.1 percent, a full percentage point lower than this time last year, according to the U.S. Bureau of Labor Statistics, Sam Houston State University’s Career Services is working to ensure its students and alumni are among those finding coveted job positions. This year, they will bring more than 88 companies and organizations to campus for the 2012 Career Expo and Graduate/Professional School Fair, on Wednesday (Sept. 26), from 10 a.m. to 2 p.m. in the Bernard G. Johnson Coliseum. Representatives from various companies will be on campus to speak with potential full-time employees, interns and graduate students from all academic backgrounds. A recent report published by the Texas Higher Education Coordinating Board ranked SHSU third in graduates obtaining employment after receiving their bachelor’s degrees, showing how SHSU’s graduates are among the states most sought after job candidates, said Mitch Parker, Career Services marketing and events coordinator. Among the companies that will be represented include Apple Computer, Inc.; Austin, Houston, College Station, and San Antonio police departments; the Drug Enforcement Administration’s Department of Justice; GETCAP Head Start; H-E-B; Houston Community Bank; the Peace Corps; Purina Animal Nutrition; Saks Fifth Avenue Off 5th; Southwestern Energy Company; Target Corporation; Texas Comptroller of Public Accounts; and Texas departments of banking, criminal justice, and public safety. In addition, graduate and professional programs from SHSU, the University of Houston, Dallas Baptist, the Lone Star College System, Our Lady of the Lake, Southern Methodist, Texas Chiropractic College, Texas Wesleyan, University of North Texas, and University of Texas at Arlington will be on hand to talk about potential post-graduate educational opportunities available to students. Students who are registered on Jobs 4 Kats can get a jumpstart to finding a job or internship by logging on, at Myinterfase.com/shsu/student, to find a complete list of participating agencies, as well as position descriptions of positions they are hiring for. Career Services will also accept resumes for critiquing at least two days before the expo. Sam Houston State University’s Office of International Programs will introduce students to the benefit of studying in another country and get that information first-hand, from those who have traveled abroad in the past, during the Study Abroad Fair on Tuesday (Sept. 25). Returned study-abroad students, faculty leaders of summer programs, and some of the program’s international partners will be on hand to discuss their experiences and opportunities from 11 a.m. to 1 p.m. in the Lowman Student Center Mall Area. During the fair, now in its third semester, students can access, in a single location, information about “the amazing array of study abroad options available to SHSU students” and how to apply, as well as receive general information on scholarships offered through the OIP, according to study abroad coordinator Jesse Starkey. “It is a very informal affair, so students can come and go, and check out the tables with information that is interesting to them,” she said. Though Starkey has been with SHSU for only a little more than two years, she said she has seen a definite increase in the amount of interest in studying abroad, facilitated, in part, by a larger OIP staff who are dedicated to assisting students. “I can say that the number of students studying abroad for the full semesters (fall or spring, or academic year) has tripled since 2010, and it looks like those numbers will continue to increase,” Starkey said. “The majority of students who study abroad go on our faculty-led trips, which are short—two-week to one-month long—trips, usually held in the summer. In 2013 we will be offering our first winter-term faculty-led trip and hope to make those a regular occurrence in the years to come. “An important note about study abroad in a national perspective: only about 1 percent of U.S. college students study abroad, so having that on your resume when you graduate puts you at a competitive advantage over 99 percent of your peers,” she said. For more information on the fair, contact Starkey at 936.294.3276. The Sam Houston State University Junior Fellows will host a series of seminars over the next month for students interested in graduate or law school that will bring in guest speakers from the fields of law, public policy, and political science. The series will kick off on Wednesday (Sept. 26), when Matthew Manning, assistant dean of admissions at Texas Tech Law School, will address strategies for getting into law school, while also providing information about Texas Tech Law, from 3:30-5 p.m.
On Oct. 8, the Junior Fellows will host a panel of speakers from 3:30-5 p.m., including representatives from the University of Houston Law School, the Bush School of Government and Public Service, Kaplan Testing, and a practicing attorney. Students will have a chance to hear from each speaker and learn about the timelines and strategies for getting into graduate or law school, how to prepare for standardized tests such as the LSAT or GRE, what schools look for in personal statements and letters of recommendation, and career prospects in law and public administration. The presentations will be followed by a question-and-answer session. Finally, the Junior Fellows will be partnering with Kaplan Testing on Oct. 20 to provide a mock LSAT for students interested in law school, during which students can take a test that was actually used by LSAT and will be professionally scored. The exam will be administered from 10:30 a.m. to 2:30 p.m. While the score is unofficial and will not be provided to any schools, Yawn said taking the mock test a great way for students to see where they are in the studying process and determine whether a preparatory course is desirable. The events are open to all students, but space is limited and spots must be reserved by contacting Yawn at mike.yawn@shsu.edu. The Junior Fellows host numerous programs for students every semester as part of their mission of promoting education, public service, and professional development. For more information, visit Politicalsciencejuniorfellows.wordpress.com. Sam Houston State University’s Wind Ensemble will be joined by “one of the most outstanding trombonists today” for their first concert of the season on Thursday (Sept. 27). The Wind Ensemble Concert, featuring Boston Symphony Orchestra trombonist Stephen Lange, will begin at 7:30 p.m. in the Gaertner Performing Arts Center Concert Hall. The program will also include Mark Camphouse’s 2005 work “Fantasia on ‘Black is the Color of My True Love’s Hair,’” led by graduate conducting associate Rachel Denson. Lange, whom McInturf calls “one of the most outstanding trombonists today,” will also play a short recital earlier that day, at 3 p.m. in the GPAC, collaborating with faculty pianist Ilonka Rus. He also will work with students in a master class following the recital. Both are free and open to the public. A native of Dallas, Lange joined the BSO trombone section in the fall of 2010. He previously held the assistant principal trombone chair of the St. Louis Symphony Orchestra from 2000-10, making his solo debut with the orchestra in 2007 in Frank Martin’s Concerto for Seven Wind Instruments. During his time in St. Louis, Lange helped found, and was a member of, The Trombones of the Saint Louis Symphony, a chamber group composed of the SLSO trombone section. The group gave master classes and recitals throughout the Midwest, culminating in a recently recorded compact disc 4.1. He has also performed with the San Antonio Symphony, the New York Philharmonic, Cincinnati Symphony Orchestra, Kennedy Opera House Orchestra, the Extension Ensemble, and the Colorado Music Festival. In addition to studying at Juilliard, Lange has taught at the University of Texas at San Antonio, Washington University in St. Louis, and is currently on faculty at the New England Conservatory of Music. The Wind Ensemble is the premier student wind band in the School of Music. Tickets to the evening concert are $15 for general admission, $12 for senior citizens, and $5 for SHSU students. The Sam Houston State University Alumni Association will take Bearkat football fans to Houston again this year, sponsoring a charter bus for the 87th “Battle of the Piney Woods” rivalry game on Saturday (Oct. 6). The bus will depart from the Chemistry and Forensic Science Building parking lot, on the corner of Sam Houston Avenue and Bowers Drive, at 11 a.m. that day and will return immediately following the game. Once at Reliant Stadium, participants will have the opportunity to participate in all the tailgating festivities. The Alumni Association will prepare food for the first 1,000 fans to visit the alumni and university colleges tailgating area, which will be in the Blue Lot 22. The cost is $30 per person, which does not include game ticket. Seating is limited, and reservations are requested by Oct. 4. Kickoff for the annual Sam Houston vs. Stephen F. Austin rivalry game is at 3 p.m. In 2010, 24,685 fans packed the lower bowl at Reliant Stadium. Last year, 25,145 spectators saw the Bearkats rolled over the Jacks 45-10 on the way to a 14-1 record. Ticket sales for the 2012 “Battle” are ahead of last year and a new attendance record is expected, according to Paul Ridings, associate athletic director for media relations. Approximately 28,000 tickets are available in the lower bowl, which can be purchased online at gobearkats.com/tickets. For more information, or to reserve a seat, call the Office of Alumni Relations at 936.294.1841 or go online to alumni.shsu.edu. SHSU will host a public auction on Saturday (Sept. 29) beginning at 8:30 a.m. at the property warehouse in the Sam South Complex, at 2424 Sam Houston Ave. Items will be sold, “as is, where is,” piece by piece or in lots to the highest bidder. Some auction items include televisions, exercise equipment, file cabinets, couches, pottery wheels, and a golf cart, among others. In addition, 1994 and 1995 Ford Aerostar vans will be auctioned off. Vehicles can be removed the day of the sale if paid by cash, or check with original current bank letter of credit guaranteeing payment. Otherwise, vehicles will be held for 10 working days to allow check clearance. Cash or checks will be accepted with proper identification. All items, except vehicles, must be removed after the sale until 2 p.m. or 8 a.m. to noon and 1-5 p.m. the following week. Sale items will be available for viewing on Friday (Sept. 28) from 8 a.m. to noon and 1-5 p.m., as well as from 7:30-8:30 a.m. on the day of the auction. For more information, call property coordinator Wayne Frosch at 936.294.1903 or 936.294.1908.